The veal you desire, you will find it at Vanlommel. 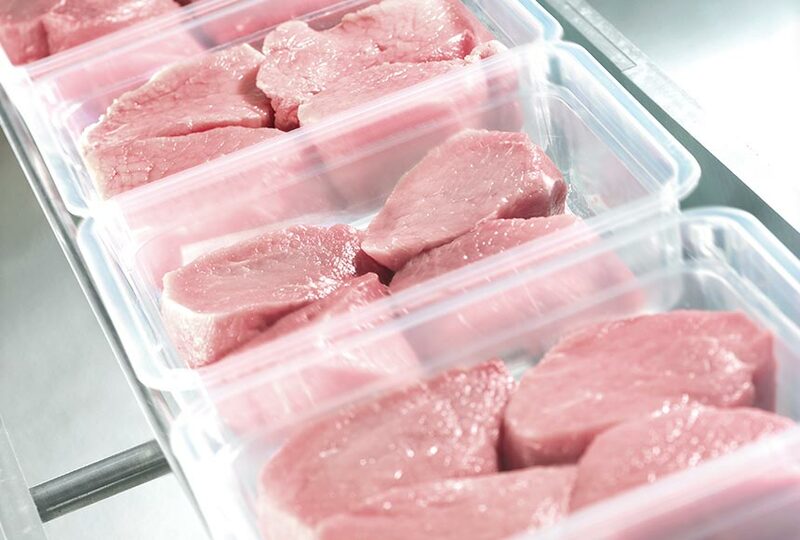 Origin, cut, packaging, model: Vanlommel works on demand for each of its customers: retailers, wholesalers, butchers − be it carcasses or packaging for the consumer, the specialists personally select the meat that satisfies the customer’s expectations. This customisation is only possible in a flexible, modern and efficient environment in which traceability and control are crucial at each stage. Vanlommel has one of the most modern and efficient slaughterhouses in Europe. Everything is done at one location: not only the slaughtering, but also the butchering of the different cuts, and the loading of the veal for transport. Thanks to this all-in-one principle, all quality controls are conducted in optimal conditions as well. Craftsmanship and on-demand work: they’re all-important to the cutting of veal. Vanlommel’s experienced professionals provide you with the cuts that you require. Discover the possibilities via the book of veal cuts. The fully automated cutting room is the showpiece of Vanlommel’s slaughterhouse. Over a closed and controlled line, the veal follows the path from complete carcass to a vacuum-packed cut of veal. It is self-evident that traceability is the first matter of importance in this system. In this high-tech cutting room, in addition to the flawless traceability, Vanlommel also considers customer-orientation of paramount importance. Thus − after a clear discussion of the customer’s requirements − a specific cut can be programmed that meets the customer’s requirements to the maximum. And the new system not only benefits the customers but the employees as well. To enable them to work in an ergonomically responsible way, they stand on platforms that are individually adjustable in height, which guarantees an optimal working posture. Moreover, employees are trained intensively in their specific job, which results in high accuracy and efficiency. You are a retailer interested in customised packaging? In the company, samples are continuously taken from the carcases, the cuts, the machines and the infrastructure. The in-house laboratory and the external laboratory conduct very frequent analyses on both raw materials and finished products. The laboratory conducts controls on the effectiveness of daily cleaning as well. The result of these efforts (among other measures that we take) is validated by Vanlommel being awarded the Higher Level IFS certificate.